This breakfast was so good, we ate it twice during the camp out! It was slightly different each time but delicious both times. This was my first weekend camp out with my oldest son’s Boy Scout troop. He crossed over from Cub Scouts in February and until now, it had worked out best for dad to go with him. Needless to say, I was excited and ready to learn new things. Dutch Oven cooking is great when cooking for a crowd. Our family loves to use the Dutch oven on camp outs and even in our own backyard. We cook everything from whole roasted chicken to pizza and of course lots of soups and stews. But breakfast casserole was a first for me. Cooking with a Dutch oven can be intimidating. (See the Scouting Magazine’s article for a general tutorial.) The first Mountain Man breakfast was for adults only while the boys planned oatmeal for their breakfast. Other adults on the trip commented they had never used one before and were worried they would ruin the meal. Our kind Scoutmaster reassured them it would be fine. The Dutch oven works just like an oven. It is made of thick cast iron. It is heated with charcoal on the bottom and top. The trick is to use more charcoal on the top than the bottom. This creates a hot oven without burning the bottom. The next trick is to keep the lid steady and flat when you open it so that ashes don’t fall into the food. Luckily the third tip is not to open it very often to keep the heat inside the oven! The last morning of our camp out, we made it again for everyone. The second time, we cut up and added all of our leftover onions and tomatoes from the previous nights taco bar. We also used up pur leftover sour cream and salsa! Start charcoal in a charcoal chimney. A charcoal chimney is a a device that looks like a giant metal coffee cup with a wire bottom. Your charcoal will be ready in 10 minutes or less using this method. Beat the eggs and cut any veggies or special ingredients while your charcoal is starting. When charcoal is hot, pour 10-15 briquettes on a fire proof surface. Then set the Dutch oven on top of the coals. Cover the top with 15-20 briquettes. Let warm for about 2 minutes. Open Dutch oven and add beaten eggs. Stir to scramble eggs, cover and let cook for two minutes. Open Dutch oven and add potatoes o’brien and little smokies. Stir and cover for 15-20 minutes. Open Dutch oven, stir and then top with cheese. Cover for two minutes to melt cheese. Open and dish up! You can top with salsa, hot sauce, sour cream or fresh veggies. Enjoy! 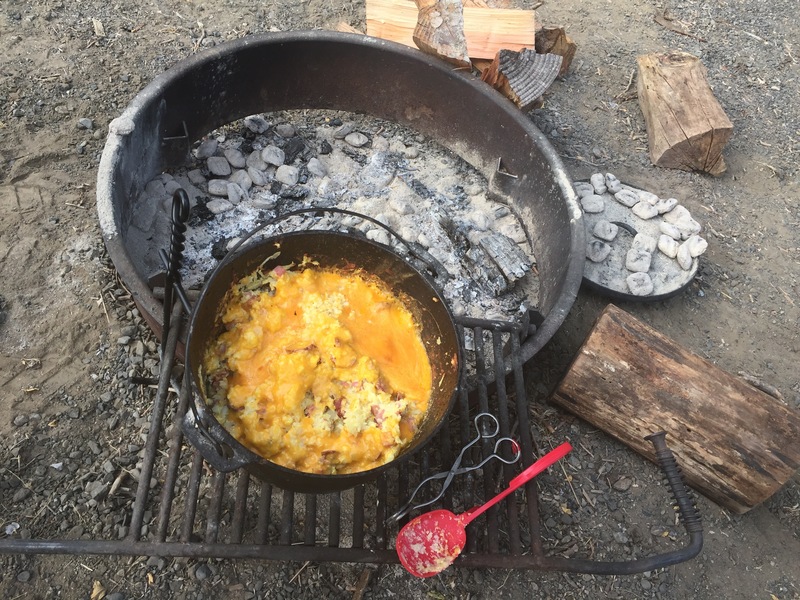 This entry was posted in Boy Scouts, Dutch Oven, Healthy Lifestyle, Recipes, Scouting. Bookmark the permalink.